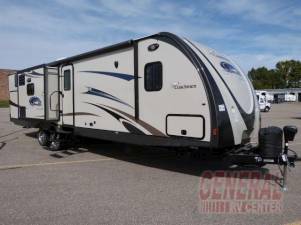 Freedom Express Bunkhouse Travel Trailer w/Rear Futon w/Flip-Up Bunk Slideout, Wardrobe/TV/Ward./Double Bunk, Pantry, Ent. Center, Refrig., 3 Burner Range &u Microwave w/Overhead Slideout, Step In Entry Closet, Kitchen Island w/Dbl. Sink, Slideout Booth Dinette & Sofa w/Overhead Storage, Side Aisle Bath w/Angle Shower, Toilet & Sink, Dbl. Bath Entry, Door to Front Queen Bed w/Wardrobes Both Sides, Front Pass-Thru Storage, Rear Ext. Camp Kitchen and Much More!